Are you looking for somewhere to hold your Christmas Party ?? well look no further. 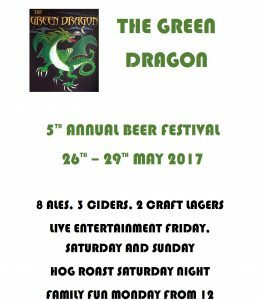 The Green Dragon has everything you need to put on a works Christmas do or an intimate meal with loved ones or a fun family feast. Our Christmas Menu will be available from the 22nd. You will need to pre book your table in advance and a non refundable deposit of £10 per person will be required. 3 days before you dine with us we will need your menu choices back. This will help us to provide you with the best service possible. November 2013 until the 25th January 2014. We would love it if you would join us for drinks before Santa makes his way down your chimney. We will put on a few nibbles and play a few tunes before you make your way back out into the cold to get ready for the day ahead. Children are most welcome and games will be laid on to keep them entertained. We will be open for just a couple of hours xmas day from 12.00-2.30. A glass of Champagne, Orange Juice or even a Bucks Fizz awaits you when you join us at this wonderful time of year. Please note though that the doors will be locked at 3pm sharp in order that we can enjoy our own xmas dinner. You help in exiting speedily would be much appreciated. It’s Party Time. We hope that you will join us for our very first New Year Party. There will be a disco provided by the young but very talented Charlie Green plus nibbles to help soak the alcohol up. Children are more than welcome to join you but we regret that they will not be permitted to stay after 10pm. This is a very informal event but we do hope that you pop a little bit of sparkly on or maybe don a suit or two just to spruce up the occasion.